These anemones make wonderful cutflowers and will attract butterflies. Their vivid colors will brighten up any garden and will surely get noticed. 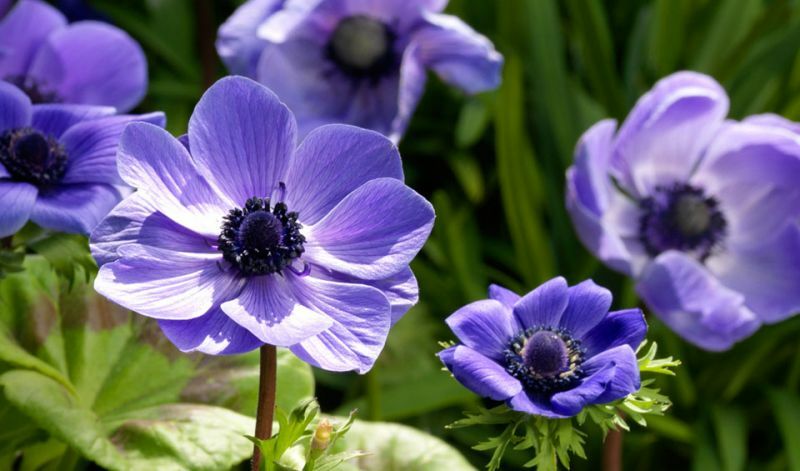 If you live in a zone (7 or lower) where these Anemones are hardy, leave the corms in the ground. In borderline areas, mulch them well for insulation during Winter. In cooler zones treat them as an annual and plant new ones again next year since the corms are difficult to store successfully. SINGLE FLOWERING: 'Bride' (white), 'Hollandia' (scarlet-red), 'Mr. Fokker' (blue), 'Sylphide' (violet) and 'The Caen' (mixed colours). DOUBLE FLOWERING: 'Admiral' (violet), 'Governor' (scarlet-red), 'Lord Lieutenant' (blue), 'Mount Everest' (white) and 'St. Brigid' (mixed colors).